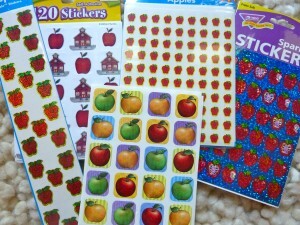 When I think of September, I think apples!! (Although at the grocery store this morning they were stocking Halloween candy – seriously?? Perhaps I’m just way behind.) Back to apples… there’s apple picking, apple cider, apple pie, etc. 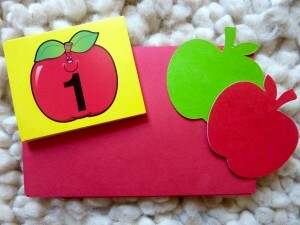 Just as there are lots of ways to eat and drink apples, there are also many apple themed station activities that can be used in My Obstacle Courses. In this post I will share some materials that I have used to help me with this theme. Over the next few weeks, I will also share how I have used them in the past and how I will use them this year with Andrew. I will also explain how they can be modified to build skills at various skill levels. As with every themed My Obstacle Course I put together, I begin with a “treasure hunt” around my house to see if there is anything I can use. 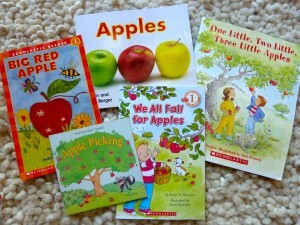 In my hunt, I looked for anything that was red, yellow and green representing the colors of apples. 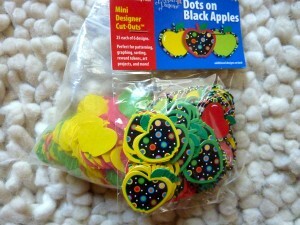 If you are interested in some of these items but don’t know where to get them, here is the link to an “apple” search I did at Creative Teaching Press and also one I did for my favorite local teacher store, Teacher Heaven. (Note – I have no affiliation with either of these companies, I just want to share where I get my materials so if you’d like to have the same materials you can get them.) I have purchased thematic materials like this over the years and since these are only used during our My Obstacle Courses, I am able to bring them out each year and use them in new ways according to the skills and concepts Andrew is ready for. I would love to hear from you about what skills you are working on with your child so I can post on station activities that are helpful for your child!! As always, you can email me at obstaclecoursemom@yahoo.com or post on my My Obstacle Course Facebook wall.